The disclosed trading game is comprised of a clearing house setting up specific contracts defined as issues each having no innate financial value but of local, national or international interest and involving social, financial, business, political, sports, or general, etc. matters that can be influenced by the actual or potential occurrence of different events or factors. The value of the issue contract might change in value, up or down, depending on how the participants, individually and collectively, believe the resolution of the issue has been advanced, via bids/offers tendered on the contract and trading via the Internet. An important aspect of the trading would be the periodic polling by the clearing house of the interested traders as how-each believes the known current events or factors might influence the subsequent trading prices of the contract, tabulating and reporting the poll results, giving a predicted bias for all participants to evaluate and act on, and monitoring continued open trading of the contract at bid/ask/traded prices. 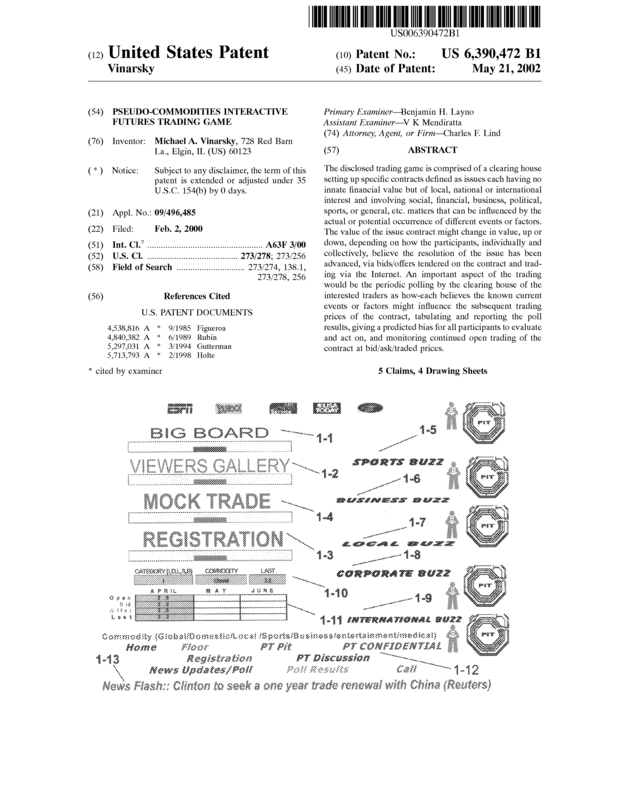 Page created at 2019-04-21 18:13:03, Patent Auction Time.